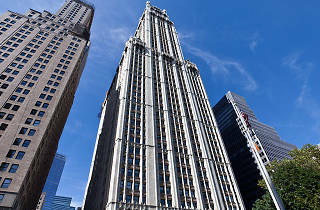 This century-old building is one of New York City’s 20 tallest, and at the time of its completion in 1913, it was the tallest in the world. Its lights were turned on in a fancy opening ceremony by President Woodrow Wilson, who pushed the on switch from Washington, D.C. 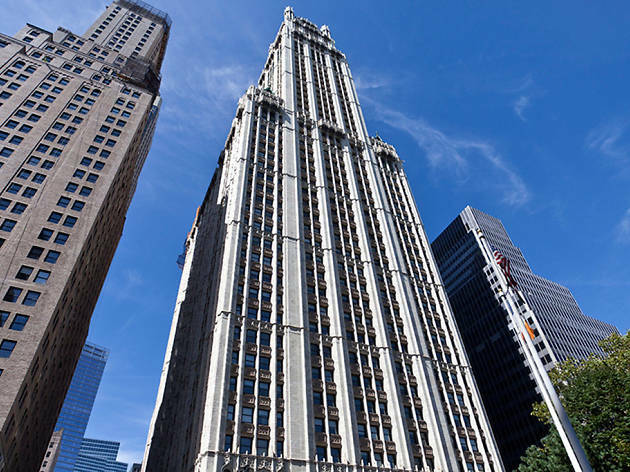 Since the demise of the Woolworth Company in the ’90s, the building has passed hands to property developers who plan to convert the top 30 floors into luxury condos. You can still tour the lobby, however, with its stunning glass and marble interiors. GORGEOUS LOBBY! And if you get a chance to take the tour, do it! The guides are very well informed and its not just an architectural tour, you also get an interesting look at the OPULENT life of Frank Woolworth. A great gem I had no idea was even here!